we want your fit to be exactly perfect and exactly you. on the occasion that your jeans do not fit, please email us at customercare@unspuntech.com with your order number and photos of problem areas so that we can make the best jean possible for you! we accept returns on unwashed, undamaged, and unaltered merchandise within 14 days from the date you received your order. your request will be processed within 1-2 business day and you will receive an e-mail confirmation that your exchange has been authorized. once your exchange item had been confirmed, please allow up to 20 working days of processing time. we default to exchanges because we know that we can make you look your best, but if you decide that you would rather not have your own denim unspun jeans we can offer a refund. unspun offers free worldwide delivery. 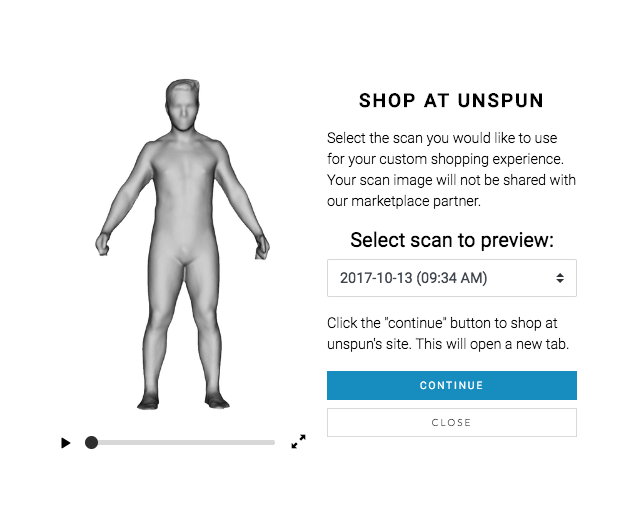 once your order is confirmed and 3d body scan completed. the processing time is 14-20 working days. all US & Hong Kong orders qualify for complimentary express ground shipping, the delivery time is around 2-5 working days. for international shipping, delivery times vary based on location, but should arrive within 5 to 10 business days. when your order has shipped, we will send you a confirmation email that includes your tracking number so that you can follow the progress of your shipment. unspun is here to answer any questions or concerns you may have. reach out via: customercare@unspuntech.com. we will get back to you within 1-2 working days. lwe're a collaborative bunch always looking for ways to cross pollinate. unspun accept visa, mastercard, and american express credit cards as well as paypal. unfortunately, we cannot accept cash, checks or money orders at this time. tax charges may apply at checkout. you will now be diverted to www.denimunspun.com - start shopping! The Site is not directed to children under the age of 13, and we will never request personally identifiable information from anyone whom we know to be under the age of 13 without verifiable parental consent. If we become aware that a customer is under the age of 13 and has registered without prior verifiable parental consent, we will remove his or her personally identifiable registration information from our files. our denim jeans are made on-demand by fusing state of the art technology and customisable fashion. we don't believe in inventory. the true meaning of perfect fit should start from your body. clothing should fit you, not the other way round. sign up below to support and inspire others to celebrate who we are, how we live and sweat, feel good look good, truly.